It’s that time of year, and folks are calling to order a guitar for Christmas. 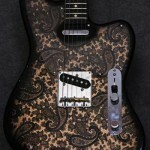 With a 10–12 month turnaround on all custom guitars, it’s a good time to contact me to get your order in for Christmas 2013. Get the low-down on ordering a custom guitar. Crook Guitars for Sale Now! If you need a guitar for Christmas this year, here are two guitars and a bass available for sale and immediate delivery. Contact me now! 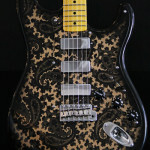 Black and Gold Sparkle Paisley S-Style $2400 SOLD! TeleMaster Jr. NEW BODY SHAPE! $2400 SOLD! 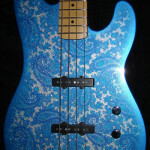 Blue Sparkle Paisley T-Bass 4-String $2400 SOLD! This entry was posted in Story Behind the Guitar. Bookmark the permalink. 3 awesome instruments… I have seen all 3 of these finishes and they are truly beautiful! I have several Crook Paisley guitars and can report that they ALWAYS get attention when I perform. They look amazing on stage or at home. I have 2 Crooks, they make wonderful Christmas gifts. First class guitars by a first class builder. I also have 2 Crooks, among a number of other high end guitars. My Crooks are flawless and works of art. Order for next Christmas, or anytime really. They will become family heirlooms! I know mine wil be.